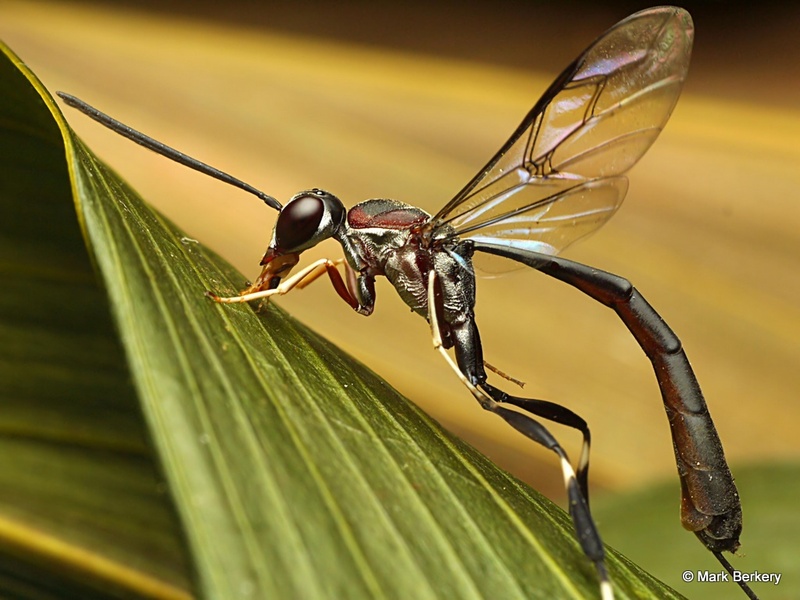 One recent day I noticed all these Ichneumon wasps about. They were flying around checking dark spots on the wood and anything upright. I have seen them before doing this, once, and what happened was the wasp turned round and lowered her pointed end into the darkness and ‘I suppose’ laid an egg, having found something in the darkness to lay it on. They can smell or otherwise sense with the tip of their tail, very useful that, to a wasp. 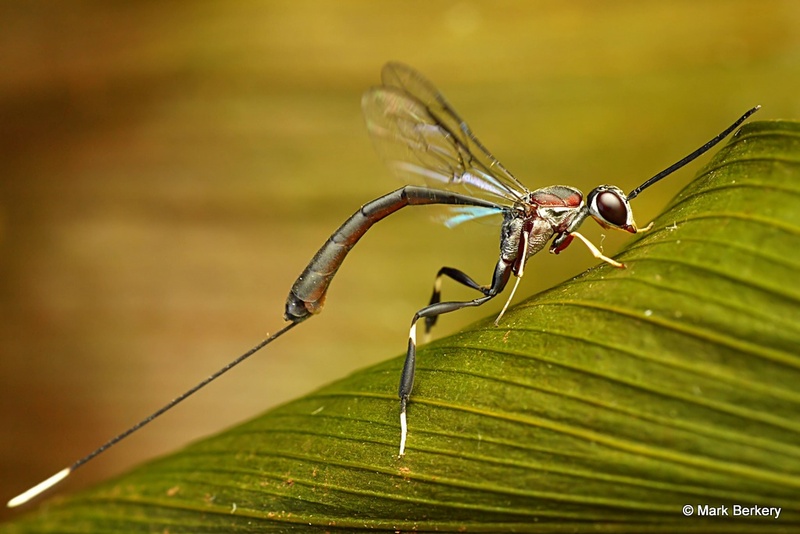 And it’s not really a tail, it’s an ovipositor, or egg depositor down which she delivers her eggs to a suitable place for growth and development – survival. That’s what they do when laying time comes, the egg is laid on another creatures laying, such as a grub, and lives and grows on that. Nature doing what it doe, one thing living off another. Humans do it too, but they’ve gone mad and feed off each other now. Those movies about people going mad with a rage virus are a metaphor for the truth that seems hidden from most. It’s been happening ever since self reflection caused instinct to warp into emotional self interest. holy moly Mark, you bring their beauty… in an intimate way to our hearts, thank you. Mark excellent close up as always. I think I asked you that before what micro lens you are using or any recommendations. I fixed my 20D Canon and I want to use it for macro. I always get confused in the store since the person selling knows nothing about macro. You seems to be expert. On the side note I really enjoy your thoughts based on the actual facts. I never knew about those wasps. We have similar here, and they probably have the same function. Thanks for sharing again. Good to see you are still up and about. Mail is on the way re lens. Outstanding photos – a joy to view! I love how you captured the delicate transparency of the wings. Thanks Nia. Yes, everything is in its place and it’s all good in the end. Yes, we’re all insane, and the violent rage media are matched only by shows about law enforcement, the endless struggle to rein in those “bad” impulses. I think it’s about the illusion of separation, though, the belief that we are discrete organisms independent of one another, which makes violence and excessive acquisition of stuff seem like a good idea. As always, your photography is stunning. I had never seen the exquisite beauty of an ichneumon before. Thank you. Thanks Rachel. It’s an indication of intelligence to see it. And to reduce it to such fundamental proportions as separation and belief is very close. We are separate therefore we must compete to survive, though it is the emotion that is competing and surviving. Interesting analogy. But, yes, we do feed off each other, however, I believe this has happened since…well…forever. Ha, ha. Teasing me. :) There’s no need to swat them, they are harmless and in fact help keep the balance of things, parasitising spider and other young. Forever is only since the beginning of time, and time began when we started to think. It is only then that we thought about what was until then instinct, and it began to move as emotion – death to peace of mind. Wow, that’s a real beauty and so well shot. 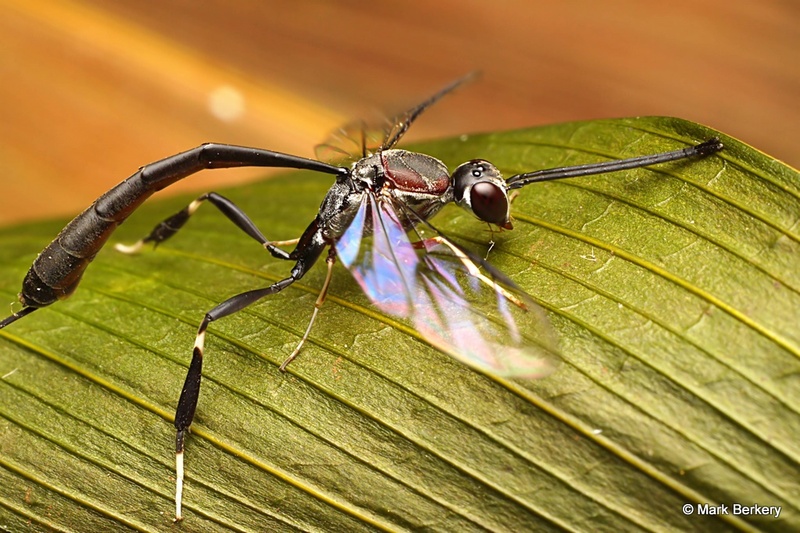 I only get the black and white striped Ichneumon wasps aplenty, but none this pretty. Time to go out there again lose yourself in the pulse of life. BTW, do you still do your macro meditation days ? Hello James, good to hear from you again. Things are warming a bit but I think last years flooding is having a significant effect on the populations and seasons. I don’t do the macro days as such but anyone is welcome to come out with me, just bell me or email if you want to meet up. They are many species here in Brisbane. Sometimes I watch them among the plants in the garden as they go from place to place seeking god knows what. Hello Michael Jamyun. Pleased you are still with me. And how is your photography coming along? What is your site? u found it already Mark..anyhow thanks for visiting my site..this is my url anyhow. http://www.jamiun.com. Love all the soft colours in these. Great focus and details as always.